Water Levels – High, Low or Normal? After last year’s remarkably low water levels in the Parry Sound region of Georgian Bay this year has seen a welcome rebound. The question now is whether the levels are still low, somewhat high, or perhaps ‘normal’. Well the levels certainly aren’t ‘normal’ in as much as there is seemingly no real normal with anything remotely impacted by weather and climate. What can be reasonably asked is whether water levels in this part of Georgian Bay are close to the historical averages and/or chart datum. With respect to chart datum in June it seems we are about 0.6 meters above the mean average low water levels and 0.8 meters below the average high water levels. Comfortable average perhaps? Here’s a link to the most revcent Canadian Hydrographic Service data. Regardless, the water levels make boating a bit more comfortable in the area. I was talking to one sailboater who said he was able to get into the government dock at The Pancakes for the first time in a decade. Despite the high water levels it seems boating traffic is down in this part of Georgian Bay. It might be the higher price of fuel, but it’s probably the cooler and less predictable weather. Temperatures certainly seem to be ‘comfortably cool’ for this time of year with a bit more rain than might be expected. That’s based on my realization that the lawn and garden haven’t yet required watering, and there hasn’t been a need for fans in the windows. Boating this year is wonderful – lots of water and not too hot. Come on up and enjoy it while summer is still around to welcome you. 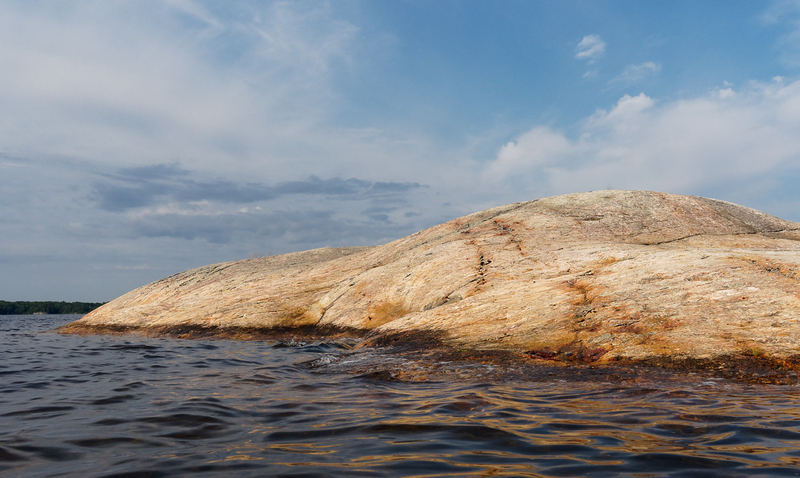 Parry Sound Power and Sail Squadron’s fifth GeoBayCache has been placed and confirmed on Windsor Island, on the southwest of Franklin Island. It’s officially Cache #6. Depending on whether you are using a Degrees or Degrees/Minutes format. This is a trickier cache to access as there is no government dock. It will mean pulling up to the shore or anchoring out and using a dinghy to get to shore. It has been suggested that the best approach is from the east in an area that is referred to as Windsor Island Harbour. On some charts an anchorage is shown that is close to where the cache can be found. Parry Sound Power and Sail Squadron’s fourth GeoBayCache has been placed and confirmed on The Pancakes, an island a couple of kilometres south of Snug Harbour. (Our Commander managed to place this one and a couple others last weekend and I’m just getting around to posting them up.) It’s officially Cache #9. There is a government dock on The Pancakes, but it can fill up so be prepared to circle back in an hour if you don’t want to anchor and ‘dinghy’ in to shore. The water is high enough that access to the dock is much easier than in previous years. The island itself is quite flat, ergo the name, and quite easy to get around and explore. It also offers some crude but quite usable bathroom facilities. As always (You are a Power Squadron graduate aren’t you?) be careful on the water and on the islands. You may come across poison ivy and the protected Eastern Massasauga Rattlesnake. Neither should be a concern if you keep your eyes and ears open and your hands to yourself. Check out information at the Parry Sound Power and Sail Squadron GeoBayCaching page for information on the Squadron’s geocaching program. Parry Sound Power and Sail Squadron’s third GeoBayCache has been placed and confirmed in the Regatta Bay area on Franklin Island. It’s officially Cache #3. There is no government dock in Regatta Bay so you will need to anchor or pull up on shore to find the cache. Wet feet are a possibility. Come August you should find Cardinal flowers marking the general area. The cache itself is not really hidden. The idea of the program is to provide boaters with an opportunity to explore new spots in the Georgian Bay Biosphere. There seems to be lots of water this year, so there shouldn’t be too many surprises if you follow the charted routes. But be careful on the water and on the islands, you are likely to come across poison ivy and the protected Eastern Massasauga Rattlesnake. Neither should be a concern if you keep your eyes and ears open and your hands to yourself. Parry Sound Power and Sail Squadron’s second GeoBayCache has been placed and confirmed on Copegog Island. It’s officially Cache #8. Depending on whether you are using a Degrees/Minutes or Degrees format. As with the Huckleberry Island Cache there is a government dock, in this case co-sponsored with the Wasauksing Band, so there won’t be wet feet. The cache itself is on the other side of the island from the dock, less than a 100 meters away, and not really hidden. 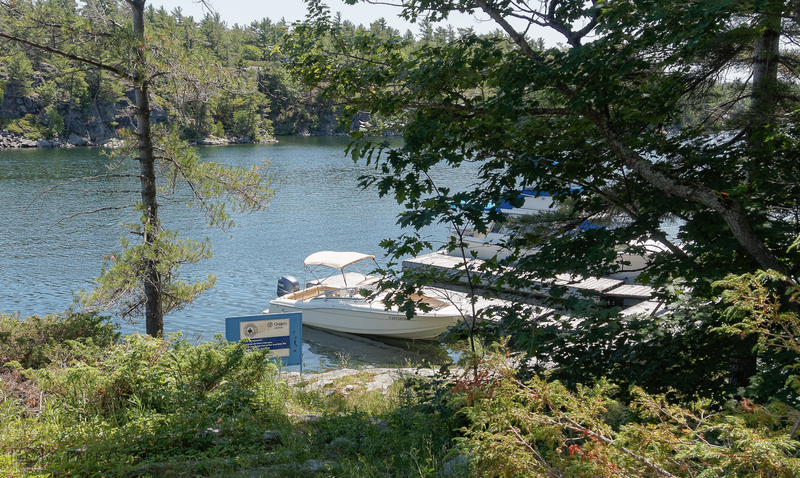 The idea of the program is to provide boaters with an opportunity to explore new spots in the Georgian Bay Biosphere.